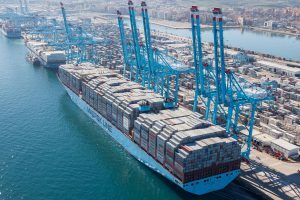 The Port Authority of Algeciras (La Autoridad Portuaria de la Bahia de Algeciras, APBA) has signed a co-operation agreement with IBM to participate in the TradeLens platform, a blockchain-enabled shipping solution, that was jointly developed by IBM and Maersk in order to improve transparency and visibility along the supply chain. The port’s press service informs that this initiative forms part of the innovation strategy of Algeciras. As we wrote earlier, Maersk and IBM unveiled their mutual project back in March, 2017. The companies have been creating a solution based on blockchain technology to manage transactions between shipping lines, shippers, freight forwarders, ports and customs. It was launched in early 2018.The product allows to share information between all players of a supply chain system in real time and in an encrypted form, thus helping eliminate fraud and errors, reducing costs, transit times and promoting sustainable transport. Since its launch, TradeLens has managed to obtain a relevant critical mass. By the end of 2018, the platform had incorporated over 100 organizations, including maritime and land carriers, large freight forwarders, customs authorities and more than 20 port and terminal operators across the globe, including APM Terminals, PSA Singapore, International Container Terminal Services Inc, Patrick Terminals, Modern Terminals in Hong Kong, Port of Halifax, Port of Rotterdam, Port of Bilbao, PortConnect, PortBase, and terminal operators Holt Logistics at the Port of Philadelphia. In short, TradeLens allows several companies to collaborate and work in a standardised way forming a solid and connected network, provides data of the different transactions to the platform, guaranteeing the confidentiality and security of the same. So far, TradeLens has already registered more than 230 million shipments and processed over 20 million containers.